Will the time come when virtually all the coolest small trees and shrubs heretofore relegated to the gardening cheater zones of 7 and 8 are bred for creation of varieties that can be grown by the great unwashed, that larger portion of homeowners foolishly digging holes in outlandishly colder climes? Perhaps not in my lifetime, but it’s getting interesting. She’s a beauty. 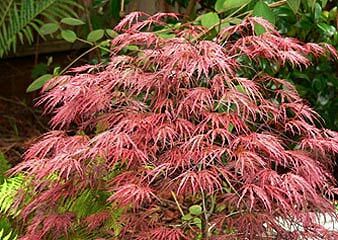 Depending on soil and sunlight exposure, ‘Queen’ exhibits sizzling red to orange-red to burgundy, palmate (7 to 9 lobes) foliage cascading down in the classic weeping form. This is a dwarf, clump (multi-trunk) tree maturing to a height of 8 to 10 feet with a spread, depending on pruning, of 7 to 12 feet. It can be found in single trunk form at nurseries, or pruned to be a single trunk tree after three years in the ground, though in either scenario I would stake it for several years. 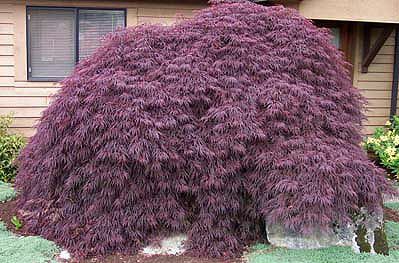 The standard clump form actually serves both the interests of the tree and the owner best. ‘Crimson Queen’ grows in full sun to part shade. In Zone 5, full sun serves well, but in zones 6 and warmer, a bit of respite from intense midday sun will keep leaves from scorching. Avoid areas of strong wind. In any zone, the ‘Queen’ is perfectly comfortable in dappled sunlight or the classic half-day sun, half-day shade scenario. You’ll note diminished bloom (red) in these shadier situations, but you’re not growing it for the inconspicuous spring flowers, you’re growing it for the foliage and form. In winter, the plant displays lovely sculptural attributes. 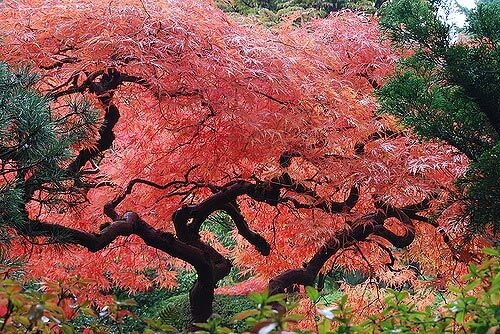 The tree is fairly adaptable to soils, best to plant in well-drained soil of average fertility. There are no serious insect or disease problems. Stem canker can occur, but is not common. It’s important to water ‘Queen’ every three to four days the first six weeks it’s in the ground, then weekly after that for the first two seasons, in order to establish a broad and healthy root system. Moderate bi-weekly watering is advised during peak summer weeks of high heat. She’s kicking out a lot of leaves, and grows at a fairly quick pace. Annual spring application of a granular tree fertilizer under and out to the drip line is a good idea. Plant ‘Crimson Queen’ where it will reign visually supreme in the landscape; this is a diva, a main focal point. Looks great near the house in properly large foundation beds. Weepers always look good near water, particularly streams and waterfalls. Plant it near boulder outcroppings. After five to six years in the ground, an annual regimen of base pruning to open up views of the trunk(s), and removal of branches to give the tree an oriental airiness is a neat trick, but one that should be researched thoroughly prior to initial attempt. Attention zone 4: Yes, we fools in Minnesota are now planting ‘Queen’ in and around the Twin Cities, in protected places near house foundations and away from any chance of harsh winter winds. They are doing fine after six seasons. This is not a global warming thing, don’t get me started; in the past six years we have had several typical, bitter winters, and in fact have had sustained periods of warmer winters in the late 1800s and 1930s than we have averaged over the past fifteen years. So we could get a dandy of a bitter winter one of these years, and perhaps they all die. But so far, surrounding the trees in late fall with 18-24” of fluffed marsh hay (November, prior to establishment of frost in the soil) seems to do the trick. Perhaps ‘Crimson Queen’ has been thoroughly misdiazoned; USDA Zones 4-8 for this tree, anyone?